Prinknash double bowl - 6¾" (171 mm) long, 3" (76 mm) high. The Prinknash Abbey Pottery was founded in 1942 by the monks when they found a seam of clay during some building work. 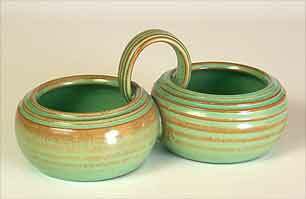 Their work is typically red earthenware, often with a metallic glaze. The Benedictine monks continued to make pottery at the abbey in Granham, Gloucestershire until 1997 when the pottery was sold to the Welsh Porcelain Co.